First line: Erin used her third-generation lock picks. From the inside cover: When Yale professor Dr. Edward Kender's father undergoes chemotherapy for colon cancer and the supply of the critical drug Culovort suddenly runs short, Kender hires P.I. Erin Pulaski to prove that something more sinister is going on at Schiffer Hartwin Pharmaceutical. On the same night Erin finds proof of malfeasance, the pharmaceutical company's "Mr. Fix-It" is murdered behind the drug company's U.S. headquarters. The big guns, Savich and Sherlock, are sent to Connecticut to join the local Special Agent in Charge, Bowie Richards. The case becomes more complicated for Erin, since the brutal murder can only mean that the pharmaceutical house has a secret of epic proportions - one it would do anything to keep hidden - and she alone holds the key evidence that will nail them. 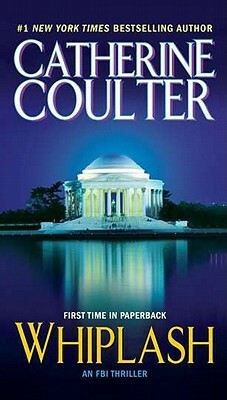 My thoughts: This is the 14th book in Catherine Coulter's FBI Thriller series and it was another solid hit. Once again Savich and Sherlock are investigating two cases simultaneously, this time cases that have them traveling back and forth between DC and Connecticut. The cases keep them on their toes as they work to put all the clues together. Working side by side and then apart, it is clear to see that they really can put their private lives aside to focus on their work. Sherlock is quite an amazing agent - going from a motherly figure to hard-core agent as the case merits. She is able to make connections and pick up on things that the male agents seem unable to see, as in the case of Erin Pulaski, a private investigator/ballet teacher turned child care provider for none other than Agent Bowie's daughter. This certainly allows for some interesting scenes as Erin knows she should inform Bowie that she was the one to break-in to Schiffer-Hartwin and Bowie realizes that Erin is a little too curious about the murder victim and it's connection to Schiffer-Hartwin. I also liked the hint of a romance that ensues between Bowie and Erin - I just wish that we would get to see what becomes of it as because they are minor characters, we don't always get to revisit them in later books. I was a little skeptical that once again, there is the hint of paranormal plot, but in this case, it wasn't as big as it could be. It seems that again Savich's sixth sense is bringing him cases, in this case, the deceased wife of the senator contacts Savich. Hopefully this is not going to be the norm in the rest of the series. I do plan on reading the next two books and will see what happens with them. I love how these books keep you on you hooked right from the beginning and there are just enough twists and turns to keep you in suspense without going overboard. So, have you ever wished that one or more of the minor characters become regulars in a series or get their own story? From the back of the audio case: Bang, bang, she's back! Stephanie Plum, the tough-talking, mace-packing female bounty hunter from New Jersey, has returned to thrill and amuse listeners in the third book of this acclaimed series. 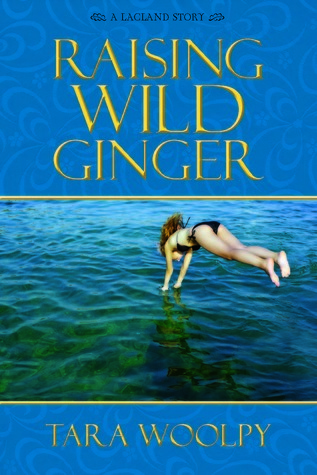 Best-selling author Janet Evanovich creates an outrageously high-spirited romp through the gritty Trenton landscape. Cursed with a disastrous new hair color and unable to shake Lula - a 230-pound former prostitute and bounty hunter wannabe - Stephanie must find Mo Bedemier, Trenton's most beloved citizen, before it's too late. With the body count rising, Stephanie struggles to stay one clue ahead of gun-toting drug dealers. Fast-paced, impudently funny, and screaming with suspense, Three to Get Deadly is Evanovich at her provocative best. C.J. Critt's lively narration brims with moxie, and will leave listeners checking their rear-view mirrors for Plum's big blue '53 Buick. 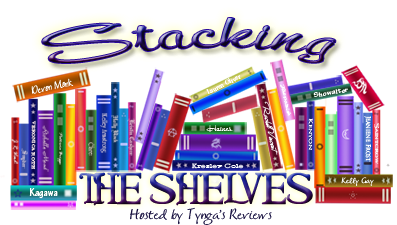 My thoughts: This is the 3rd in Janet Evanovich's Stephanie Plum series and it was hysterical. Once again, Stephanie is on the case, this time looking for Uncle Mo, owner of the local candy store/ice cream parlor and known by everybody in the neighborhood. Uncle Mo has skipped his court appearance for carrying a concealed weapon. The problem is that everyone is upset that Stephanie is hunting him down and that's proving to be difficult to make any headway. She also has some smaller cases that of course do not go as smoothly as she had hoped. Helping her with the cases are Joe Morelli, Ranger, and even Lula. The scenes where Lula joins Stephanie on stake outs and break-ins are hysterical, especially since Lula is not known for being subtle. There are some scenes with Stephanie and Joe, but they always seem to get interrupted before anything significant happens. Plus Joe is acting a bit weird when he's around Stephanie and when she decides to do a little surveillance outside his house, things don't exactly go as planned! I can't wait for the next book in this series to see what cases Stephanie handles next. I'm also curious to see how things turn out with Stephanie and Joe - do they ever wind up together? Audio thoughts: I think narrator C.J. Critt does a fabulous job in this production. She nails the New Jersey accent and gives all the characters their own distinct personalities and voices. She conveys just the right amount of humor, sarcasm and even danger when needed. Today is the final discussion post for Audiobook Week 2012. 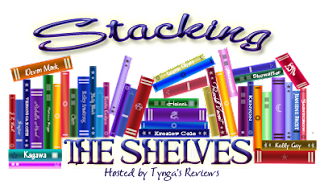 I want to thank Jen at Devourer of Books for hosting a great week of discussions centered around audiobooks this week. I tend to find reviews of audio books from my fellow bloggers. There are so many bloggers out there that listen to audios, so it's easy to find them. 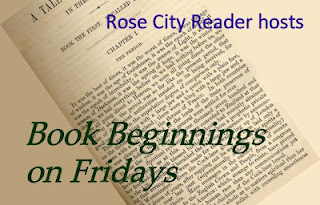 I also try to participate in the Sound Bytes meme at Devourer of Books on Fridays, which is a place where bloggers can link their audio book reviews for the week. Alternate suggestion: Narration preferences: single narrator, multiple narrators, full cast, etc? I have to say that I don't usually pick an audio book based on the narrator. I pick an audio because the story seems like a good one and I think the audio will hold my attention. Of course, that isn't to say that I ignore the narrator completely. When I pick up an audio, I do look to see who's narrating it and if it's someone I'm familiar with, then I am more likely to go with it. If it's a narrator I'm not familiar with, I really use the story to determine if I will go with it. As for narrators, I like when they can give all the characters in a story their own unique voice. I think this is especially important when it is a single narrator. I also like when the narrator uses the appropriate accents - if the story involves people living in the south, I want a good southern accent; if the story involves British people, I want a good British accent. But, I don't want over the top accents. Just enough to make it believable. I've only listened to a handful of male narrators - one as a single narrator and the others as a cast of multiple narrators. At first, I was sure I would like the single male narrator, but it ended up being fine and an enhanced the listening experience as one of the main characters was a male as in the case of Rescue by Anita Shreve, narrated by Dennis Holland. When it comes to single vs. multiple narrators, I don't really have a preference. I've listened to both, though the majority have been with single narrators. With the multiple narrators, it seems to work best when there are multiple points of view as each narrator can then take on a different character, as was done with House Rules by Jodi Picoult, narrated by Mark Turetsky, Nicole Poole, Andy Paris, Rich Orlow, and Christopher Evan Welch. What about you? If you listen to audios, what do you look for in a narrator? Who are your favorites? 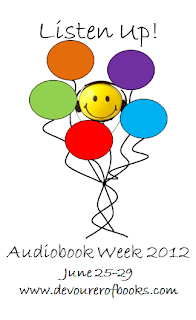 Welcome to day three of Audio Book Week! 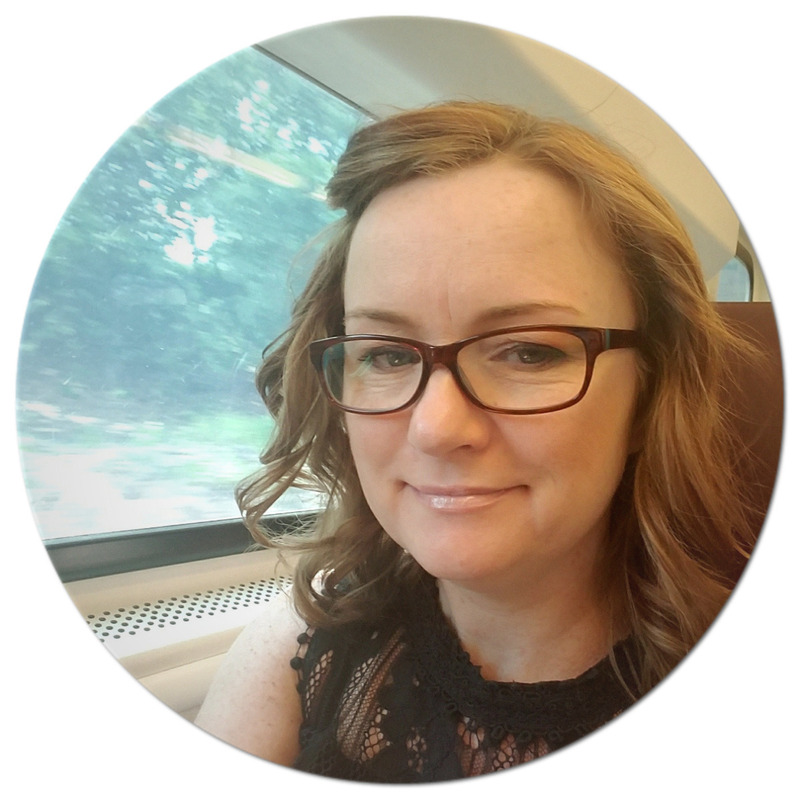 I've been having a great time visiting the audiobook blogging community and have gotten lots of tips for what to include in audio reviews to make them stand out and be helpful for others when it comes to picking audio books. Today is the mid-week meme. Spring Fever is a cute, fun story and the narrator is great with the southern accents. Still Missing is an intense story, with the narrator really making you feel as if you are right there alongside the main character. This is a toss-up between Home Front by Kristin Hannah, narrated by Maggie-Meg Reed and The Weird Sisters by Eleanor Brown, narrated by Kirsten Potter. CJ Critt - I love her reading of the Stephanie Plum novels. A Grown-up Kind of Pretty by Joshilyn Jackson is at the top of the list! This is a tough one as I feel I haven't listened to nearly enough audios to put together any team, let alone a dream team. So there you have it. What are your thoughts on these? Summary from Goodreads: There is no problem that a library card can't solve. 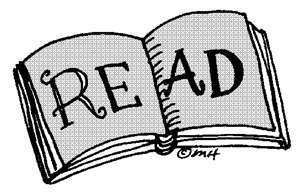 The Andreas family is one of readers. Their father, a renowned Shakespeare professor who speaks almost entirely in verse, has named his three daughters after famous Shakespearean women. When the sisters return to their childhood home, ostensibly to care for their ailing mother, but really to lick their wounds and bury their secrets, they are horrified to find the others there. See, we love each other. We just don't happen to like each other very much. But the sisters soon discover that everything they've been running from - one another, their small hometown, and themselves - might offer more than they ever expected. My thoughts: There are a few reasons why I listened to this when I did. I had finally figured out how to get audios onto my iPod from Overdrive and this particular audio happened to be available. 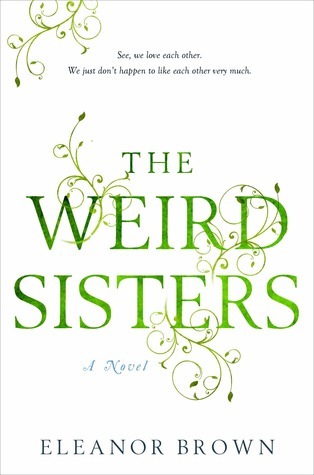 The Weird Sisters is the story of three sisters who all end up heading home at the same time. They say they are really there to help their mother who has breast cancer, but it turns out they are all running away from their lives, although they are not willing to admit that to anyone at first, not even each other. As we get to know each of the three sisters, it is easy to relate to them in some way, and maybe because I have two sisters, myself, I could really appreciate the relationships they have with each other - not always good, but always there when needed. I also think I fell in love with this story because of the family's obvious love for books. This was a family that read - much like my family - and again I could completely relate. While my father didn't spout Shakespeare as Mr. Andreas did, he does love his books and passed that love onto his seven children. Audio Thoughts: I thought that Kirsten Potter was a great narrator. She was able to give each character their own voice and I had no trouble keeping everyone separate. Even now, weeks after I've finished this audio, I can still hear Kirsten's voice as I think about this book. What about you? Have you read or listened to this book? Have you ever listened to a book and then when you think about it later on, the narrator's voice comes right back to you? This is an area that I tend to struggle with as I haven't really made much distinction in my reviews of print books versus audio books. There are times that I make a note of something about the audio production, but I am not always consistent with this. I'm hoping to get some good ideas today that I can implement in my own reviews. When I format my audio review, it is really not too different from a print review, other than before getting to my thoughts about the book, I list who the book is read by. I have listened to some really good narrators and some that were ok, so I like to be able to quickly refer to those names when looking for a new audio. I still consider myself a relative newbie when it comes to audios, even though I've been listening for a year and a half. I have some narrators that I know I will like, but haven't really come across any that I just didn't like. I also haven't come across a book that I would have preferred in print instead of audio. Have you? So, please help me out by telling me what else I should be including in my audio book reviews. What are the most important elements that you look for in an audio review? From the back of the audio case: Stephanie Plum, the sassiest, spunkiest female bounty hunter in America (or at least New Jersey) is back to take on her second case. She's armed with attitude and outrageous fashion sense - not to mention stun guns, defense sprays, killer flashlights, and her trusty .38 - and all the determination a neophyte bounty hunter can muster. In Two for the Dough, she's after a ruthless bail jumper who has an affection for mailing Stephanie deadly notes and pickled body parts, and stealing 24 super-cheap caskets loaded with contraband. When the case overwhelms Stephanie and fast-talking vice cop Joe Morelli, she calls in a real pro: her grandma Mazur, a grey-haired, spandex-wearing dynamo packing heat. In Stephanie Plum, critically-acclaimed author Janet Evanovich has created a resourceful and humorous character who stands apart from the pack of gritty female detectives. C.J. 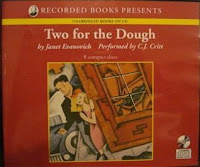 Critt's masterful New Jersey accent fully captures Evanovich's delightful sarcasm. Two for the Dough combines irresistible fun and powerful suspense. My thoughts: Can I just say that I found myself laughing out loud more times than not while listening to this story. And I think that listening is the way to go with this series. As usual, I am jumping on the bandwagon for a series late - but hey, better late than never, right? The only problem is that there are 18 books out already, plus 4 novellas, and with all the other books out there that I am trying to read, doing the audio for this series is the only way I am going to catch up quickly. And I am loving this choice. In Two for the Dough, Stephanie is still learning the ropes of her newly chosen career - that of a bounty hunter. She is given her second case - to find Kenny Mancuso. Of course, finding him turns out to be not so easy and along the way, she gets involved with another case - trying to locate 24 missing caskets. Helping Stephanie out with this case are vice cop Joe Morelli, who just happens to be cousins with Kenny, fellow bounty hunter Ranger, and Grandma Mazur, who just loves going to funeral homes to check out the details of the body and how many people show up. There is constant humor throughout this book and enough suspense to keep you hooked from the beginning and guessing until the end. I think what makes this book a great audio is the narrator. C.J. Critt has a great NJ accent and is able to give all the characters distinct voices so we know who's talking. As I plan on listening to most of this series, I hope she will continue to narrate them! June is Audiobook Month and Jen at Devourer of Books is hosting a special week dedicated to audiobooks this week. This is my second year participating and I can't wait to see what's in store all week! I have been listening to audio books for almost a year and a half now and now I can't seem to live without them. I had been primarily just listening to them in the car and every once in a while I would listen to one in the house if I was doing some baking or data entry for work. Just this year, I started listening to them on my iPod (thanks to the help of some fellow bloggers who helped me figure it all out) and now I can listen to an audio book at the gym while on the treadmill or even while I am outside watering the plants! And now that I use the iPod, I usually have two different audios going at once - something I was a bit wary of at first, but haven't had any trouble keeping the two stories separate. Since last year's Audio Book Week, I have listened to 26 audio books, 13 of which are from this year alone! 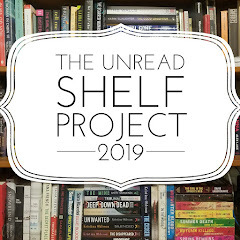 I am once again participating in the Audio Book Challenge hosted at Teresa's Reading Corner, which I wasn't going to do at first, but then when I realized I was already listening to a lot of audio, I decided to join - better late than never, right? I love visiting the other participants to see what they are listening to. What about you? How was your audiobook year? Last week marked the end of the Spring Reading Thing hosted by Caterina at Callapidder Days and I was able to finish up the last two of the three books I had left. I ended up reading quite a lot during that challenge and got some books off my shelf that had been sitting there for a while. 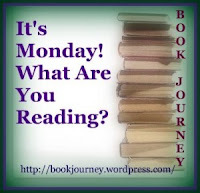 This week is Audio Book Week and Jenn over at Devourer of Books has a great week planned, filled with discussion posts, links for audio book reviews and some really good giveaways. I'm planning on participating as much as I can and am hoping to get to some of my audio reviews this week. Will you be participating? I had received an arc e-copy of this book a while ago, which I read and provided Tara a review blurb for the book. I was thrilled to see that my blurb is on the back cover of the book - how cool!!! 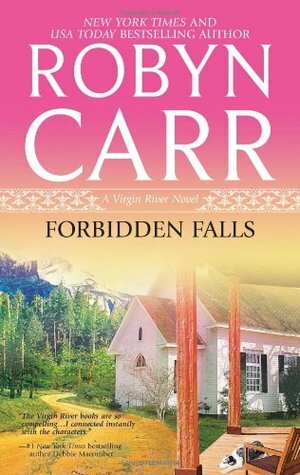 This is the 9th book in Robyn Carr's Virgin River series which I am slowly making my way through. I love that each summer brings a new book from Claire Cook. I've read all but one of her books and have really enjoyed them all. She tends to have strong leading female characters and has explored some really interesting jobs. 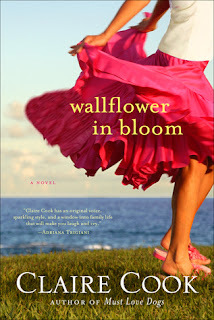 Wallflower in Bloom one is pretty good so far, especially since one of my favorite shows on TV these days is Dancing With the Stars! How does this tie in? You'll have to read the book (or my review once it's up) to find out. First line: Dare Barron heard the commotion in the police station center earlier as his least favorite offender was brought in on a drunk and disorderly charge. From the back cover: Office Dare Barron has had a crush on Liza McKnight ever since he was a teenager. But despite his lifelong attraction, the closest he's ever come to interacting with Liza is watching her regularly bail out her brother down at the police station. Dare's dark past with Liza's brother, Brian, has always kept him from pursuing her. But suddenly Liza finds herself in need of protection and Dare appoints himself as the man for the job. And while the sizzling attraction between Dare and Liza draws them together, the past threatens to keep the two apart forever. My thoughts: I have to admit that I have a guilty pleasure when it comes to reading and that is most definitely any book by Carly Phillips. This is the third book in her first Serendipity trilogy and I'm very happy to say I am glad to have spent some time getting to know the Barron brothers. Karma is Dare and Liza's story and it seems both are weighed down by some pretty heavy, emotional baggage that has affected their entire lives. It doesn't help that they keep running into each other every time Liza's brother, Brian, gets himself arrested. 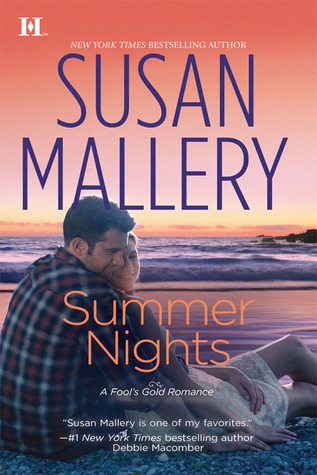 Brian gets drunk, causes a problem, lands in jail and there is Liza, bailing him out - something we come to find she's been doing almost his entire life. It's obvious there is chemistry between the two whenever they are in close proximity to each other, but it takes Liza's life being threatened before anything happens. But will it all come to an end when the danger is revealed or can they each learn to forgive not only the other, but more importantly, themselves in order to move on together? As in most series, as this is all playing out, we get to catch up with the other characters we've come to love - Ethan, Faith, Nash, Kelly and of course, younger step-sister Tess, who still manages to steal every scene she's in. 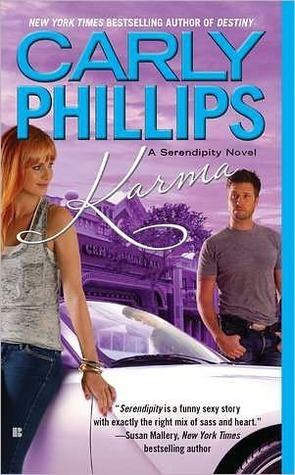 We also get to meet some new characters, who it just so happens, will be the focus of the next Serendipity trilogy. These new characters are Dare's co-workers, Cara and Sam, and I can't wait to see what Carly Phillips has in store for them! Do you have a guilty pleasure when it comes to reading? If you're coming from the blog tour, welcome! Below you'll find the next excerpt of Big Sky Country and the link to tomorrow's piece as well. If this is your first stop on the tour, you'll need to start from the beginning to get the whole excerpt. Go here, to see the full list of blog tour stops. First line: "You weren't at the funeral," Slade Barlow's half brother, Hutch Carmody, accused, the words rasping against the underside of a long, slow exhale. From the back cover: The illegitimate son of a wealthy rancher, Sheriff Slade Barlow grew up in a trailer hitched to the Curly-Burly hair salon his mother runs. He was never acknowledged by his father - until now. Suddenly, Slade has inherited half of Whisper Creek Ranch, one of the most prosperous in Parable, Montana. That doesn't sit well with his half brother, Hutch, who grew up with all the rights of a Carmody. Including the affections of Joslyn Kirk, homecoming queen, rodeo queen, beauty queen-whom Slade has never forgotten. But Joslyn is barely holding her head up these days as she works to pay back everyone her crooked stepfather cheated. With a town to protect - plus a rebellious teenage stepdaughter - Slade has his hands full. But someone has to convince Joslyn that she's responsible only for her own actions. Such as her effect on this lawman's guarded heart. 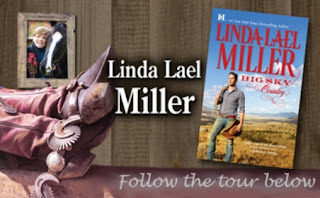 My review: This is the first in Linda Lael Miller's new Swoon-Worthy Cowboy series, set in Parable, Montana, and boy are the two cowboys in this book studs! 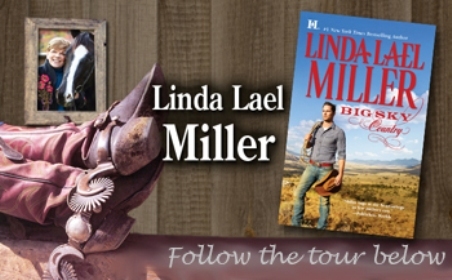 I've only read a few of Linda Lael Miller's books, but find that they are quick, fun romances involving some tough but lovable cowboys. Big Sky Country is Slade and Joslyn's story. We are introduced to half-brothers Slade and Hutch, who have never really been close, and after the death of their father has them each inheriting half his estate, they are even more at odds. Joslyn returns to Parable to make amends for her step-father's wrong-doings - something she had nothing to do with but feels guilty for nonetheless. She takes up residence in the guest house of the property she used to live in, which is now owned by her best friend, Kendra. Both Slade and Joselyn seem to be at cross-roads in their lives. Neither knows what it is they really want to do - him being a sheriff who is up for re-election, and her having spent the last part of her life trying to make up for her step-dad's mistakes. As they begin spending more time with each other, they slowly come out of their shells and start looking towards the future. Along the way, we also get to meet some other characters, who all add to the story. There's Callie, Shea, Boone, Tara, and of course, the furry-legged characters of Jasper and Lucy-Maude. We get to know just a little bit about these other characters - enough to know who they are, but not enough to be satisfied. Hopefully some of these will be the feature characters of the next book in the series. I look forward to catching up with these characters again in the next Swoon-Worthy Cowboy story, Big Sky Mountain, which is due out the end of July. Don't you just love the name of the series? Have you ever been driven to read a series just by the name of it? Memories swamped her—on the other side of the broad green lawn, her mother would have been sitting on the screened-in sunporch on a bright morning like this one, sipping coffee and reading the newspaper. The housekeeper, Opal, would have been busy in the huge kitchen, preparing breakfast. Now, her mom was in Santa Fe, living with husband number three, a successful artist. Husband number two, Elliott Rossiter, had died in prison of an embolism, and heaven only knew where Opal was by now. She and Joslyn had parted tearfully, with promises to stay in touch, but they’d lost each other’s trails years ago. Joslyn sighed, pushed back her long brown hair and wriggled out of the sleeping bag. There was no sense in moping about the past—she’d come back to Parable for a reason, and she needed to get on with the plan. So she could leave again. 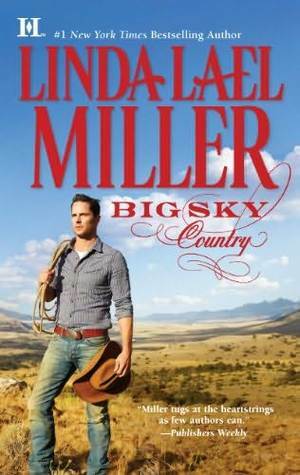 I received a complimentary copy of Big Sky Country by Linda Lael Miller from Kate at Meryl L. Moss Media Relations, Inc.